Summary: In this stylish neo-noir set in the mountainous Central Asian republic of Kyrgyzstan, hard-bitten inspector Akyl Borubaev mourns the recent death of his beloved wife–the only humanizing force in his otherwise bleak life as a homicide dective in Bishkek. As he struggles to face his personal pain, Borubaev is assigned to investigate the murder of a young woman whose horribly mutilated body is found dumped in a public park. When Borubaev discovers the woman is the only daughter of Mikhail Tynaliev, the powerful and ruthless Minister of State Security, he realizes the case will probably destroy him, regardless of where the evidence leads. Borubaev begins making enemies everywhere he turns, even as he is aided by a motley assortment of dangerous cutthroats: his wife’s uncle Kursan, whose cross-border smuggling is the stuff of local legend; the explosive police chief, who wants the case solved as soon as possible; Saltanat, a beautiful and deadly agent of the Uzbek Security Service; an entire police force of bent cops; and members of the Kyrgyz mafia. A KILLING WINTER by Tom Callaghan takes place in Kyrgyzstan, the former Soviet state located between China and Uzbekistan. The book opens with Inspector Akyl Borubaev of the Bishkek Murder Squad surveying a grotesque murder scene in the city of Bishkek. A young woman was brutally murdered, mutilated and her body cavity filled with a fetus removed from someone else. Borubaev soon discovers that the victim is the daughter of a powerful, well-placed government official which adds pressure to quickly solve the crime. Borubaev’s investigation leads him to additional brutal murders which in turn leads him into the ugly world of Kyrgyzstan politics, to the brutal Kyrgyzstan underworld and to a local Russian military base and forces him to work with a beautiful Security Service agent from the rival country of Uzbekistan. Author Tom Callaghan portrays Kyrgyzstan as an impoverished, corrupt, drug infested and lawless country with a mood of despair. The mood is further hardened by the long list of sleazy and nasty characters involved in the case. The characters are very well developed by Callaghan and fit nicely into the atmosphere developed in the novel. Inspector Borubaev is depicted as the one compassionate character in the novel who is struggling with the loss of his wife to cancer. The author also shows Borubaev’s as a cunning and tough character who can display a violent side in enforcing the law. 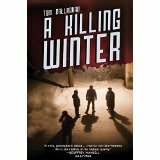 A KILLING WINTER is a tough thriller full of violence and savagery. Although the book has great characters, is quick paced, includes a lot of twists and turns and has a surprise ending, I would not recommend it to those who are the least bit squeamish. Thanks to the publisher for a review copy of this novel and to Booking Pap Pap for his review. Wow, this one must be pretty graphic. Another great review by Booking Pap Pap!